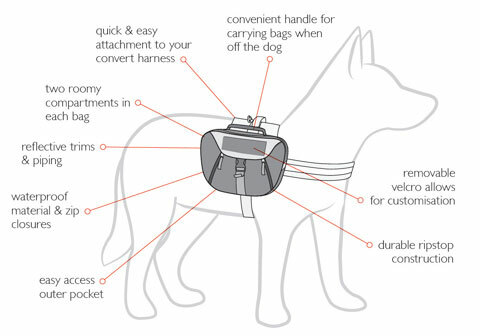 Attach the Convert Saddle Bags to our Convert Harness (sold separately) to construct a versatile dog backpack system. All the practicality and trail readiness of the Convert Harness plus cargo capacity. The EzyDog Convert Saddle Bag set has been designed to compliment your EzyDog Convert Harness, to 'convert' your everyday harness into a functional dog backpack. With an heavy duty construction that is water resistant and durable, your dog can go anywhere and hold everything. This product features two packs each with a quick and easy attachment system, two roomy compartments with waterproof zip closures, reflective trim and piping - great for twilight adventures. A convenient handle for carrying bags when removed from the convert harness, removable velcro customizable badges, and each with an easy access outer pocket for storing items you need quick. Our dog harness plus saddle bags are more versatile than traditional dog backpacks and service dog vests. Service dogs fill many roles and positions from caretakers to guardians to emotional supporters. These dogs are literally taken everywhere! Why take multiple trips out to the car to pick up items such as dog bags, water, dog treats, or dog food for your best friend when he can carry it himself? That doesn't mean you have to load him down like a mule, but it can mean a lot less hassle and stress throughout the day for both of you. The dog can also carry important items like medications for you so you don't have to carry around a tremendously heavy bag or purse. Let your big or small dog lighten the load with a dog backpack. Dogs love to work and carry things like a small backpack makes them feel like they are important and have a job or mission they are carrying out, and they'll love the extra attention and treats they receive. *Side Labels included with convert harness are default "EZY DOG".